Purchasing a new home is an exciting time in your life. The Murfreesboro Mortgage Team is here to help make the process easier. Get the facts you need to know. What are my home loan options? If you’re a first-time homebuyer, or need more space for your growing family, we’ve got the right loan option for you! There are great homes for sale in Murfreesboro and we’ll help you find the best loan for you and your family. Give us a call or stop by to learn more about the available options! Should I Prequalify for a loan? 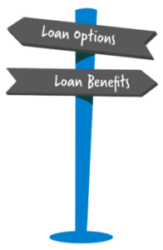 Prequalifying for a loan is a valuable step in the loan application process. Prequalifying let’s you know how much you can afford, so you start your home search with knowledge in hand. It can give you peace of mind and help you find the right home to fit your budget. The loan application process can seem tricky, but our experienced loan officers will make it feel like a breeze. Because we’re local, our team members are available whenever you need us. So if you have questions, just stop in our office for a chat, or give us a call. We’re happy to help!